The Delaware City Refinery (formerly the Valero Refinery) in Delaware City is a 210,000 barrel per day oil refining facility. The facility has production capabilities which include conventional and reformulated gasoline, diesel, low sulfur diesel and home-heating oil. 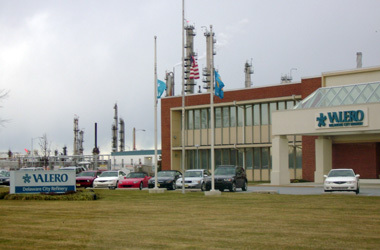 Valero currently employs approximately 710 individuals at this site. The FCCU Electrical and Instrumentation Project included several packages (projects) within several of the refinery’s existing operating units. The packages in the Electrical and Instrumentation project included the Coker, the Emergency Quench Water System, and the Caustic System. Hatzel and Buehler’s work included the installation of 2,000 feet of cable tray and the associated 5KV, 600 volt, control and instrumentation cabling running throughout the 3 units. As part of the project we also installed lighting motor controls and grounding including tie-ins to existing motor control centers and instrumentation cabinets.